Caprice, aka Dovrun Caprice, is an 12-year-old red female born May 11, 2001. Her sire is the late, great Gable Dodge, and her dam is Prima Blastincap. She has no races to her credit on Greyhound-data.com. Caprice arrived with her friend Rain Dance, and they both have plenty of living left to do! She is cat tolerant and is living in a foster home with cats and other greyhounds. 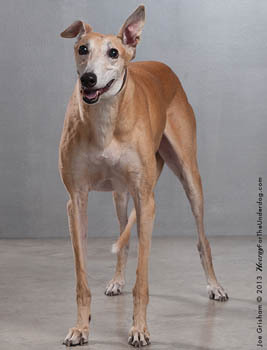 On the evening of May 27, 2012, GALT received a phone call from Judy C. in Delaware who had been contacted from someone in the south TX area regarding an ad in the paper for 4 adult greyhounds-need good home or homes. A phone call was placed to the number in the ad, and it was the sister of an elderly man whose wife had recently died. He had raised greyhounds for years, but was no longer able to care for them and had 3 females and 1 male. Two of the females are 12½ and one is 11 years old, and the male is 11 years old. 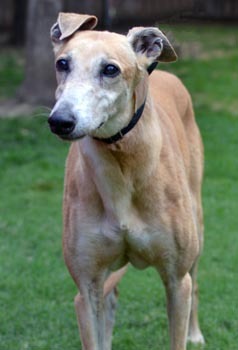 Arrangements were made for the dogs to be picked up by a greyhound volunteer, Mark B., who lives in Houston, and GALT's Stew B. met him to complete the transport to Dallas. 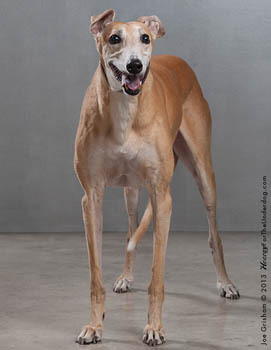 Many thanks to Greyhounds Unlimited for taking the 11 year old male and one of the 12½ year old girls. Caprice is a senior girl but don't tell her that! She acts like a 5-year-old, following us from room to room. She is a velcro dog who loves attention but not in a demanding way - she's just happy to be in the same room with you. She enjoys her morning walk and wants to greet everyone she sees. She is good on a leash, walking with her foster brother and sister. She lives with 2 cats; she likes to follow them on occasion but only to see where they go. She would love to play with them, but they ignore her most of the time. She appears to be fine with all sizes of dogs; she visits with several on her walks. Her house manners are impeccable, no issues. She does not tell you when she needs to go out so we just encourage her to go regularly and she always rewards us! She will sleep until we get up; we let her out soon after. She enjoys her meals but doesn't always finish right away, she may graze and likes to check out the other dogs food even though it is exactly the same. She will sample their bowls if you allow her but understands no and moves away immediately. Caprice is a loving girl with soft silky fur; she loves to be stroked and talked to. She has adjusted quickly to our home and we feel certain she would easily make the transition to a forever home. 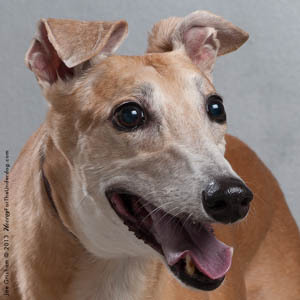 If you are looking for a sweet, loving grey, please consider Caprice!